With low unemployment and a record number of unfilled positions, the impact of a positive company culture is evident in an era of employee choice. Do you want to belong? Or do you want to just fit in? These questions are relevant whether you are an employee, freelancer, contractor, or consultant. My friend, Ann Hoeger, posed this question during a virtual coffee chat this week. Rather than a yes or no response, this question requires reflection. It brings up the important factors of personal values and tolerance for compromise. The question brought up memories of childhood, when fitting in with the right group of friends was everything. I remember with vivid detail a group of popular girls. Even though the behavior of the mean girls was not aligned with my personal values, fitting in meant I did not suffer the trauma of being left out. Fitting in gave me access, in spite of my discomfort. However, it did come with a price, one that I was not willing to pay for long. The awkward thing about trying to fit in—when the price is too high—is it never feels 100% right. There is a nagging sensation of pain and misalignment. Psychologists call this cognitive dissonance. Ann’s question, however, is about finding the right workplace and positive company culture for your time, talents, and well-being. Thinking of my own work experiences, I quickly realized the essence of these two goals. The search for a positive corporate culture and the quest for happiness leaves people with two options. Belong or Trying to Fit in? What is the Difference? A sense of belonging reflects your values and leads to a higher state of workplace well-being. Trying to fit in is a compromise based on practical decisions and necessary constraints. So, let’s take a closer look at your choices. Seth Godin, marketing author and keen observer, likens the state of belonging to finding your tribe. 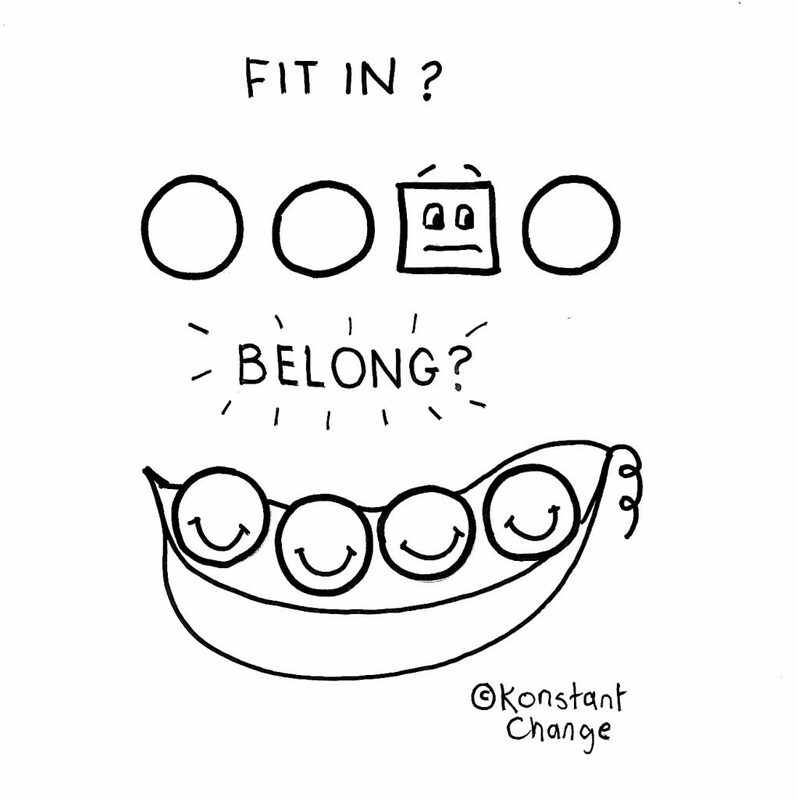 Belonging means you have discovered a community of people who share your values. A positive company culture, where you can thrive. He suggests surrounding yourself with people who believe in, challenge, and support you, will enhance happiness and accelerate your professional success. Most important, when part of a tribe, you behave in an authentic manner, making decisions based on values. There is no need to conform to someone else’s expectations that conflict with your own good judgement. Belonging means being part of an organization or working with a particular group of people that are important to you. Your environment and fellow workers matter. You care about the success of others as you work toward important company goals. Trying to fit in however, can mean an imperfect work situation is worth the effort. You may need to make the situation work for practical reasons. There is a time for fitting in. For example, your company may have been acquired, changing the nature of business and corporate culture. In this case, accommodating a culture that is at odds with your values may be a necessary survival strategy. After all, it takes time to adjust to a change. Your financial situation often requires a longer-term compromise until you find a better role. Fitting in may be useful for your future. Learning a relevant skill or gaining access to a future job opportunity are examples. As a contractor or consultant, you face these choices when you select client projects. I can think of past roles where the environment and some members of the team caused pain and frustration due to culture conflict. Yet, I often developed relationships with some fellow workers in these troubled times that lead to a positive gain in my career. And there are times when fitting in is not worth the price stress and anxiety extracts from your work-life balance. Only you know when your threshold for compromise has been overtaxed. When employee time, talent, and values are in alignment within companies, there are multiple positive benefits. These benefits are most evident at companies with positive corporate cultures, like Nike, Netflix or Warby Parker. When people feel a sense of belonging, there is less turnover, increased productivity, and a higher level of employee engagement. This leads to an attractive employer brand, increasing a company’s ability to recruit and retain employees. Regardless of how hard organizations try to attract and retain the right people, a positive corporate culture can be elusive. And, as smart as your vetting process is for finding the best workplace to optimize your happiness and growth, the misfit status may catch you unaware. Consequently, you get to choose your strategy; when to fit in and when to search for belonging and a positive corporate culture.